Learn the 9 most frequently violated US Rules and Regulations. 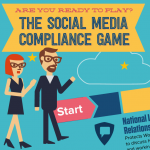 in this whimsical, simple infographic, designed to improve social media compliance at work. Post this infographic in your office or break room to inform your employees about what is and isn’t considered safe social media use. Technology advances faster than government can adapt, so laws that were enacted before social media existed often determine its lawful use. Breaking those laws can cost employers hundreds of thousands or even millions of dollars and obliterate brand equity…but most managers don’t even know that they exist. Display this poster at work to improve awareness of how the National Labor Relations Act, Fair Credit Reporting Act, Computer Fraud & Abuse Act, Electronic Communications Privacy Act, HIPAA, Communications Decency Act, Digital Millennium Copyright Act, FINRA Guidance and the FTC Dotcom Disclosure Guidelines govern social media use.